Annie, and her bother Oliver were brought into the vet clinic in Melbourne, Australia, where I work as a vet nurse. They were no more than a day old, found in a client’s shed, with no sign of their mother. They were both so tiny. Oliver weighed about 90g (3oz) but Annie was even smaller weighing only about 70g (2.5oz) and she still had her umbilical chord attached! None of us on duty that afternoon had ever dealt with kittens that young before and none of us really expected them to survive the night, but I took them home and they both guzzled their meals every two hours. By morning I was exhausted, but the kittens were thriving! Since the kittens were orphans it was my mum who suggested the name Oliver. Therefore “little orphan Annie” was the other obvious choice. And the names stuck. After a week I started to notice that Annie’s movements seemed less coordinated than Oliver’s, and while Oliver’s head tremors were easing as he got stronger, Annie’s were just the same if not worse than before. By two weeks Oliver was starting to toddle around quite happily, but Annie was struggling, falling over whenever she tried to walk, it was almost as if the back end didn’t belong to the front. Head or face first tumbles were common, and it became obvious that Annie was getting increasingly frustrated that she couldn’t keep up with her brother. I had never seen a CH cat before, but I had heard about it and started researching. Once convinced, I took my concerns to the vet who told me she had worried about the same thing. Annie as a tiny kitten. 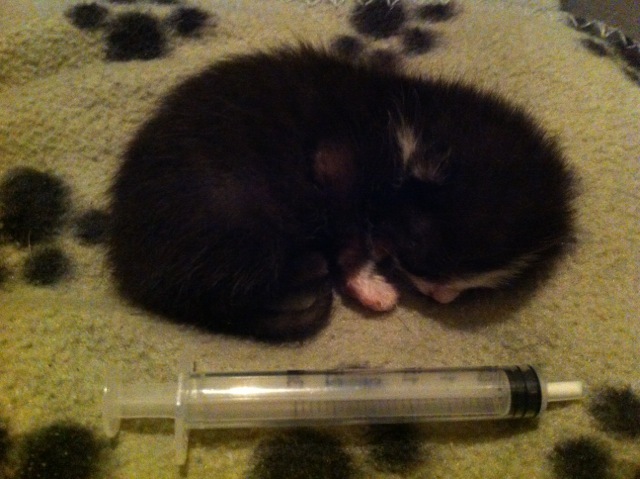 This early diagnosis was, I think, a blessing for Annie as we started ‘Kitten Physio’! The vet and I devised a few little exercises to help Annie build her muscles. Annie’s favorite was the vertical climb where I would make her climb up my body to reach her favorite spot on my shoulder! Ok, so the program wasn’t scientifically based but it worked! Annie got stronger and more determined every day. A couple of weeks later she was running and playing with Oliver! Having other adult cats in the house, the kittens were kept in an enclosure in a separate room while I was out, but they were let out when I was home and it was always Annie who was first to run out, legs going in all directions! Annie and Oliver are now nearly 10 months old (yes, I have kept them both! ), and Annie is doing wonderfully. I would assess her CH as mild; she’s wobbly and still has a tendency to tumble but it doesn’t cause her too many problems with her day-to-day activities. Grooming herself can be difficult, but she puts herself in the corner of the couch for support and she’s fine. Annie hasn’t ever had any major injuries due to her CH, but there have been times when the wobble starts to look like a limp and I wonder if its from a fall, but it can be hard to tell for sure! Nothing seems to faze Annie, and while she does seem to be aware that she has limitations she is never too afraid to push the boundaries in an effort to keep up with Oliver. This became evident a short while ago when the kittens, along with Keller and Daisy, my adult cats, were playing and jumping on and off the cat tree. Annie had never been able to make it to the top of the cat tree, which suited me just fine because in my opinion its too high for her! But Annie was determined. With a big run up, and following Oliver, Annie half jumped half scrambled and found herself at the top! Despite my anxiousness that now she had to get down, the look on her face was priceless and made me smile! Annie was surprised and elated! Then, to my horror, she leaped from the top landing in an awkward mess at the bottom, she paused for a second, then took off running! Just to prove that it wasn’t a one off she went up and down the cat tree a few more times after that all the time looking absolutely delighted with herself! Everyone who meets Annie finds her adorable which is in no small part due to her CH. Annie greets you almost like a dog, tail held high and wagging from side to side, and, while I know this is related to her balance, or lack thereof, it never fails to charm! Since Annie is only mildly affected by CH I have not had to come up with any of the ingenious ideas that others have for their CH cats but I think the best thing you can do for your CH cat is to have a friendly cat companion for them to play and exercise with. Without Oliver, Keller and Daisy, I don’t think Annie would be doing as well. 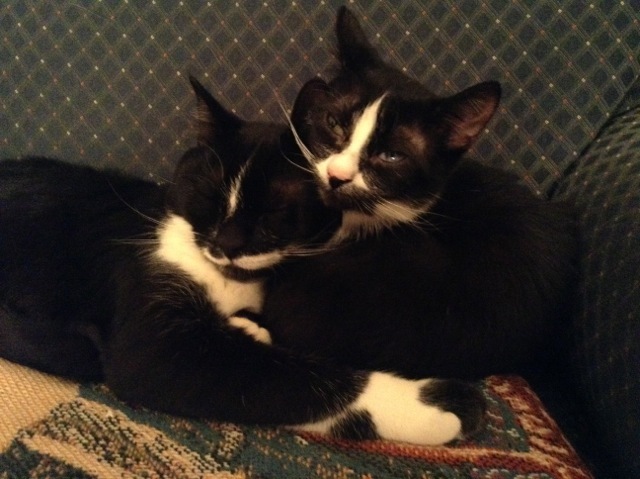 I know that Annie enjoys having her brother with her and even as I write this, the two of them are running around the house! Also, don’t discount the benefits of ‘Kitten Physio’ either! 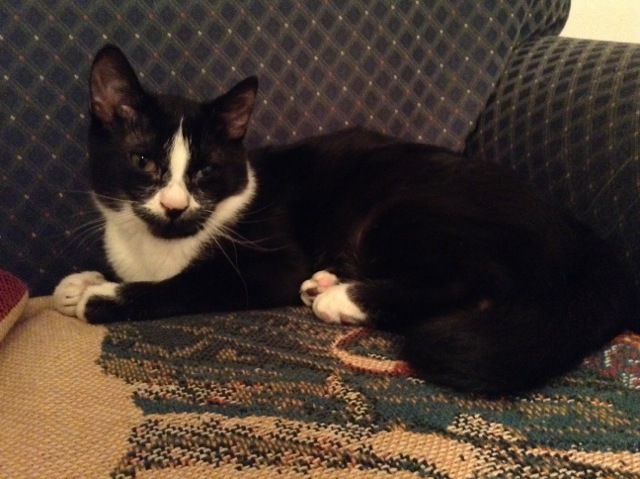 All in all, Annie is a wonderful kitten, happy, playful and affectionate. Annie’s CH appears to only make her more determined than any other cat I’ve know, let alone any other human! I know that if she puts her mind to something she will do it! What a wonderful story! What lucky kittens to end up in such a loving home! Great story, great job saving and caring for them, including the physio- therapy! That’s such a sweet story! Thanks for sharing!